After having such a busy week, so annoyed i wasn't able to join in ONCE again on my own challenge blogs, hey ho! Basic Rules you can flip it turn it etc , as long as it still looks like the sketch. all for doing a little card! so Don't forget to join in this week! You have until Monday 13th at 9am Adelaide time to join in if you wish to be considered for the prize, There is a clock on the Blog of Lauren's " adelaide" time. Of Course the rules are you must include BasicGrey Items in your work. And i thought they would be great, I find them a little hard work as they are so big, its hard to get them right, not to over do it or under do it. 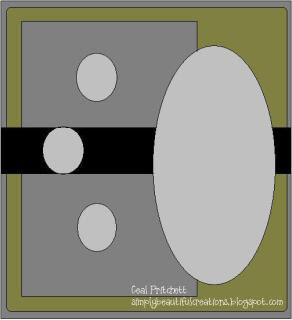 This entry was posted on 6.10.08 and is filed under BasicGrey Challenges , CupCake Challenges , Spiral Whisper . You can follow any responses to this entry through the RSS 2.0 feed. You can leave a response, or trackback from your own site. 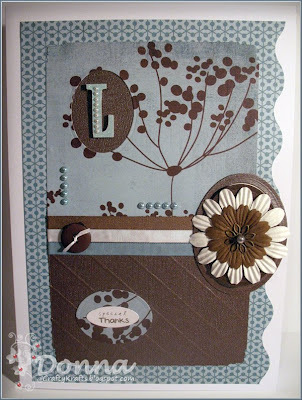 Beautiful card - I love the colour combo! 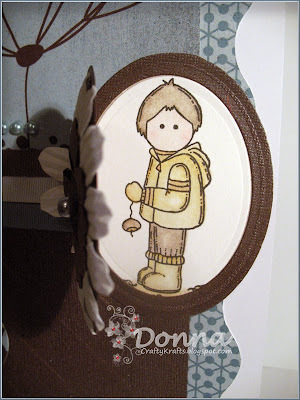 Fantastic Card Donna, absolutely love what u have done with the sketch. Just a note: I am in Adelaide also and the clock which shows Adelaide time is an hour out - we changed our clocks for daylight saving. So if it says 12 midday it is actually 1 pm. Dont want anyone to miss out over daylight saving. 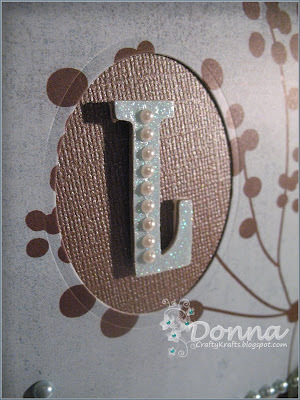 A gorgeous card Donna. I love the layout and the colours are gorgeous. Thank you for joining us in our challenge this week. I totally love your card!! The peek-a-boo flower and the color combo are just wonderful!